My given name is Sue Sullivan, but I also have a couple of aliases. I am known in the gem and crystal world as Gemstoner, a nick-name I received a long time ago that seemed fitting and has stayed with me as I do my healing crystal work. And finally, aka Mama Sue. My blues moniker given to me by a now grown up, talented blues guitarist named Ben Meine when he was about two, it just stuck. I have been infatuated with crystals and gems since I was a child. My maternal grandfather was my first teacher of the natural world. He taught me a lot of the old ways as to uses of herbs, purposes of different tree woods, and gave me my first unofficial stone classes. My formal education was a Masters in Fine Arts in Minneapolis. 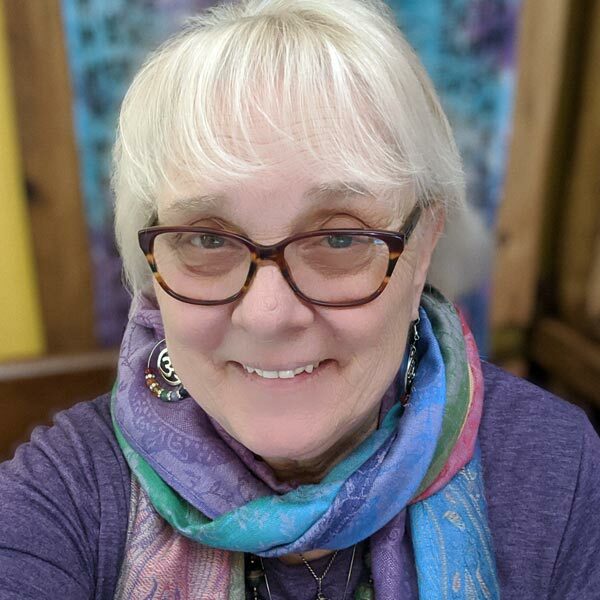 Since then I have studied Theology and became an ordained minister, and worked towards my Crystal Practitioner Certification for which I achieved a Master Certificate in September of 2012. I am also an Usui Reiki Master/Teacher. Like many artists, my interests are wildly varied. In some way, ALL of the interests seem to feed the creative process an artist starves for as a whole. Many, many years ago I was at a conference for singer/artists where we were asked to 'sing' why we were there. What came out surprised me. "I want to sing my soul free." And, I think I finally have. The joy I experience has spread to all areas of my life and fuels my creative fire. After running a metaphysical store front in Richmond, IL for 12 years, I made the decision to go back to my roots. The business of the business took all of my days leaving very little time and energy to create ... anything. So, at the end of 2014 I closed the store and moved up into rural Wisconsin. I am also blessed with the ability to hear when the gems speak. I do not consider myself a psychic, and I have not found a control to make it happen. It just comes when it comes. The messages are generally vague, many times only one or two words, but they seem to be a key to revealing answers to questions a person may have, or unlocking the door to what they had not been able to see. While I may miss all those special faces from the store, it was a good decision. My days are now happily filled working at my bench, occassionally painting, vending at several expos throughout the year, photography, creating new items for my website, writing, doing private classes in Usui Reiki, Crystal Healing and individual healing sessions, and singing regularly at local venues with some very talented blues musicians. While it may sound busy, life did become simple. I can do what I love and have been guided to do. My soul is happy, creative, joyous and free.